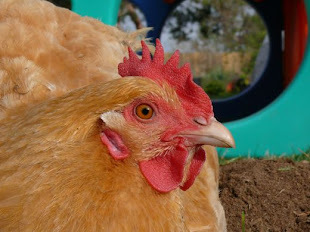 Chicken Blog: 22~ Save the Magnetron! Never pass on the chance to say Magnetron. And never pass on the chance to save a valuable appliance from going into a landfill. Our microwave died. Well, technically it was in the ICU of appliance crises, but effectively dead. No clock! Horrors! And no more heating burritos, or melting cheese. Despair! My instincts kicked in right away, and I concluded that we had a few options for solutions: It could be a cabinet for keeping hotdog buns fresh, or yarn in order, or with the little light, that still worked, it could be convenient for storing things you can never find in the dark, like flashlights, socks, cash. 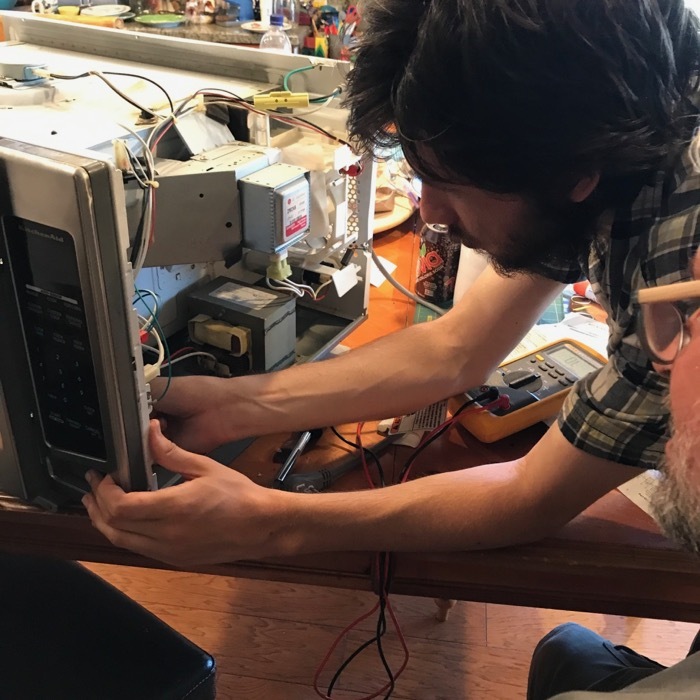 After Geoff pulled off the architectural finishing molding that surrounds the 'built-in' microwave, he pulled the whole thing out... and be honest: Did you ever think you could remove a 'built in appliance?' Will wonders never cease? He took the microwave to the dining table and started an Internet search, troubleshooting. I did a little troubleshooting, too... seeing the gaping hole in our cabinetry, I realized we had a clever spot for storing the blender, and the mixer, or I could put a little pet bed in there, and it would be an adorable spot for kitty to nap. Alas, my ideas slipped further and further down the list of possible resolutions to our problem appliance. Geoff ordered two sensors that were possible fixes. Our next issue... the choice of manufacturers to keep consumers out of the controls & gadgets zones of appliances. They use odd screws, weird little devices that take professional, specialized tools to get into. Honestly, those hurdles they put up can seem daunting, and I am pretty sure a lot of good stuff gets tossed and replaced... sometimes, it's easier, more convenient, less scary to go to the big box store. But. But, 'architectural finished' and built-in appliances cost a whole heaping lot more than regular appliances. It's not the sort of thing you can steal buy for yourself as easily as a mini-fridge. So, we were very hopeful about getting into our microwave, finding the reason for the malfunction, and repairing it. It was time to pull a a Number 34: Deconstruct an Appliance. Max figured out the way in, and if you are wildly curious for the details, please leave a comment, and we will answer any questions we can... otherwise: He fixed our microwave! One of three sensors needed replacing, and that was only an $8 part, so, sweet! 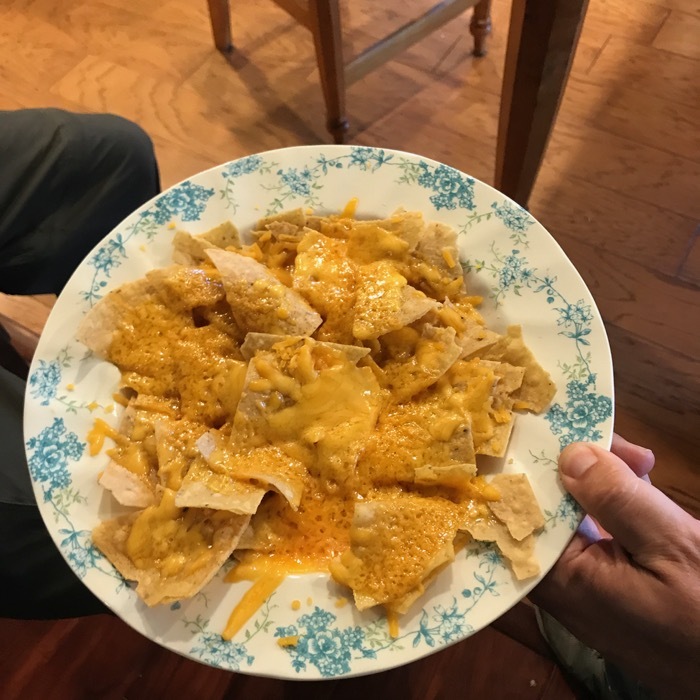 Geoff created the only true test of a microwave's functions, and melted cheese. We saved the magnetron, our clock is working, we can make nachos! Re-think. Re-use. Re-pair. Sanity restored. And I'll have to find another place to store socks and flashlights.